Pioneer High School’s FIRST Robotics team – Team 1076 Pi Hi Samurai—is heading for a world championship event next week in Detroit. FIRST stands for For Inspiration and Recognition of Science and Technology. 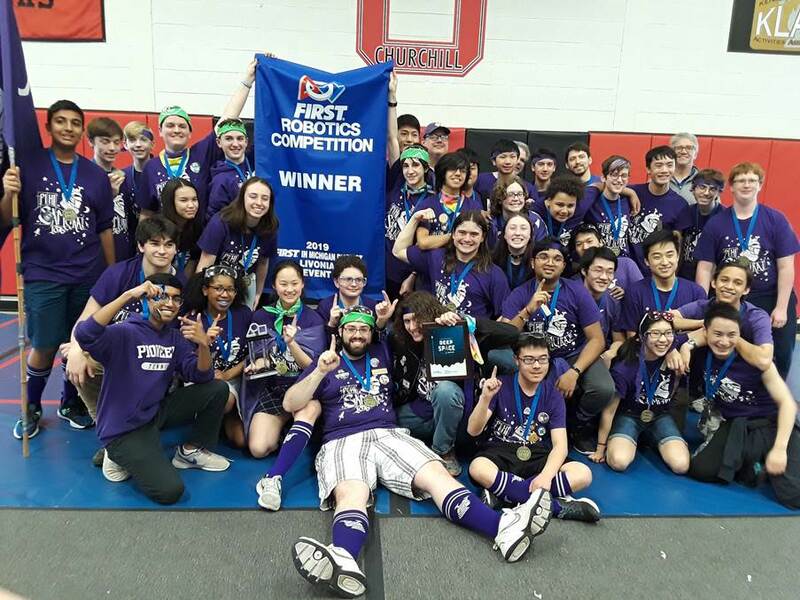 Last weekend at the Michigan State competition, the team earned enough points to qualify for the FIRST World Championship at Cobo Hall. The team will compete Thursday, April 25 and April 26 against more than 700 other teams from around the world. I have watched these fine outstanding young students battle week after week against adversity and hardships. Over this difficult season they have molded together as a formidable team. Like with any athletic sports championship run the competition is tough. Pi Hi students persevered to meet challenge after challenge. I’m proud of what this team has accomplished and wish them success in the future. They deserve our support. I am the proud parent of two PiHi Samurai!! The team is a determined group of students. They are led by a dedicated coach and wonderful mentors. So proud of what they have accomplished and excited for the bright future of this team! !